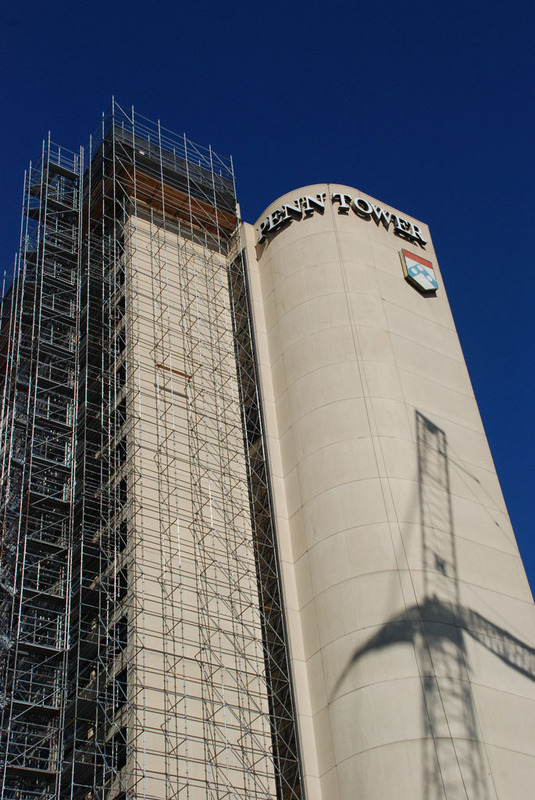 This is a huge scaffold, shoring and mast climber job at the old Penn Tower. 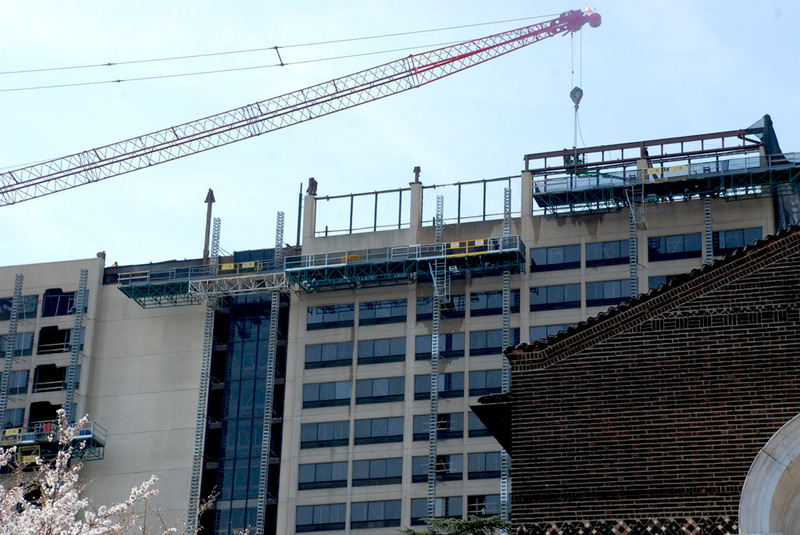 The building is being demolished for the new Hospital Pavilion at the University of Pennsylvania. 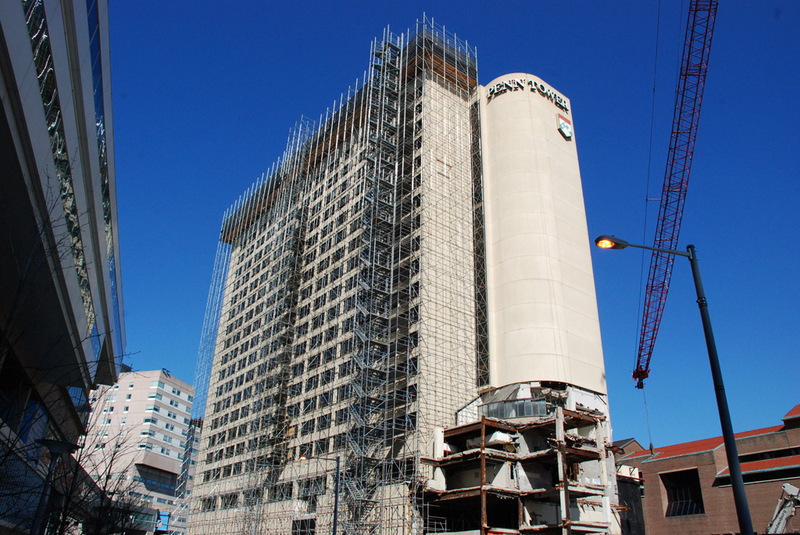 Not only did we erect a giant scaffold all around three sides of the exterior…But we also shored up 16 floors at the same time! That’s correct 16 floors at the same time! And we installed the 3 mast climbers on the opposite side of the building. It all has a very specific purpose in the overall plan. Look carefully, into the windows of the photo above, and you can see our shoring inside. Crews are taking a unique approach to bringing down the old structure because it’s in a sensitive area with tons of people, buildings and traffic all around. 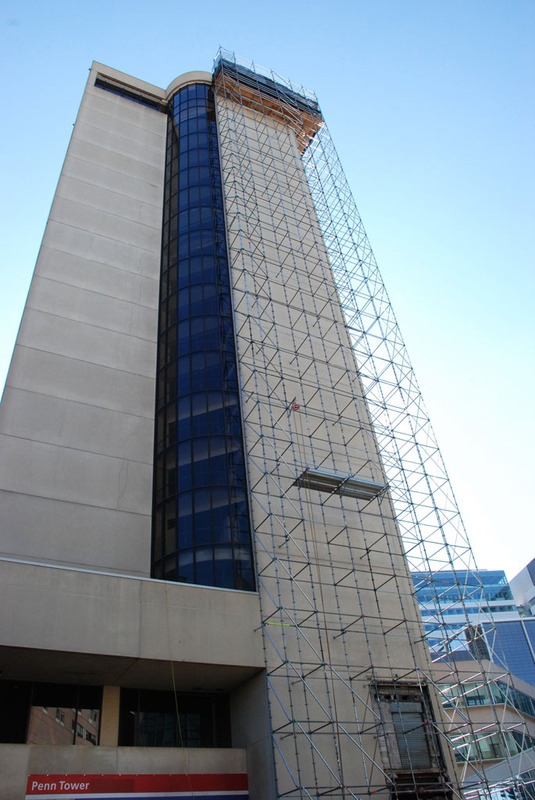 So instead of a traditional implosion or wrecking ball this twenty-story, 40-year-old, former Hilton Hotel is being dismantled from the top down and inside out. An extensive recycling program is also being implemented where they are separating steel from concrete, removing aluminum, copper and other metals from the debris. It’s all to minimize the amount of refuse going to a landfill. They estimate that around 85% of the material will be diverted from landfills and recycled. 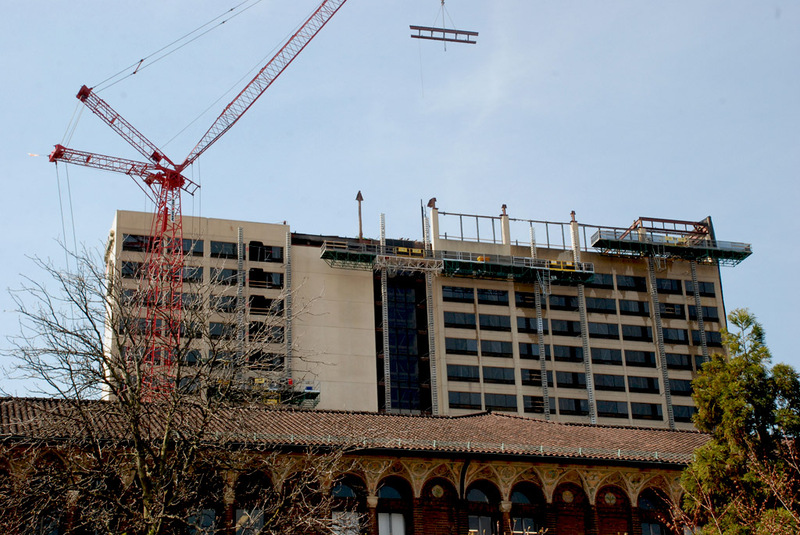 And in its place they will be building a $1.2 billion hospital facility, doubling beds and adding 50 operating rooms, and thus, creating an innovative facility that will support Penn’s world-renowned researchers, clinicians, and faculty for years to come. 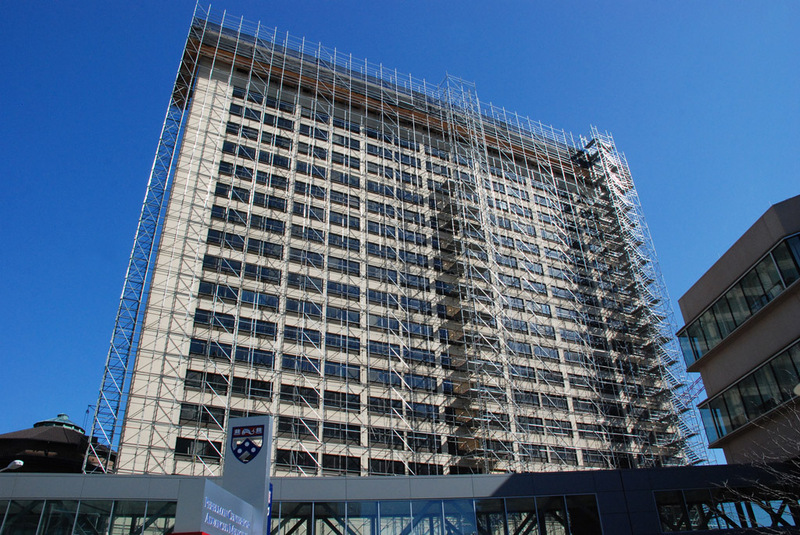 Superior Scaffold erected this giant scaffold system around three sides of the entire exterior. 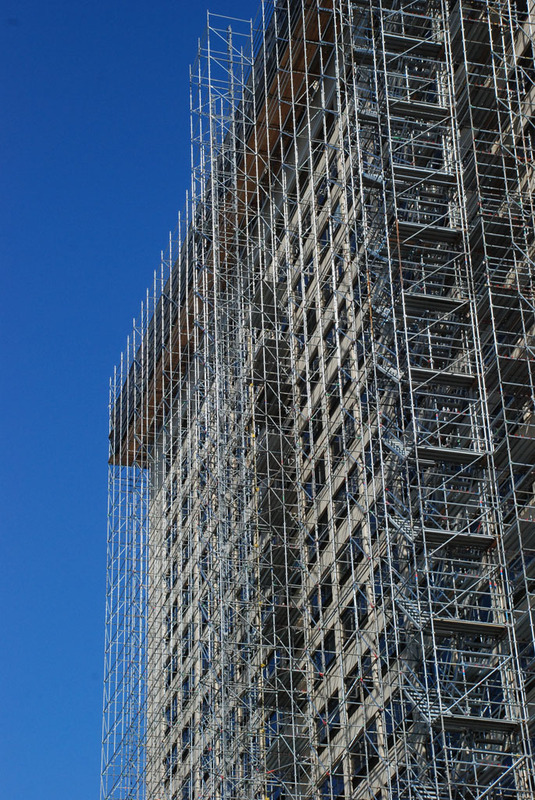 It’s a 220 foot high scaffold system with debris netting at the top 3 levels to keep everything inside. We had 2 crews working to get it erected in record time. 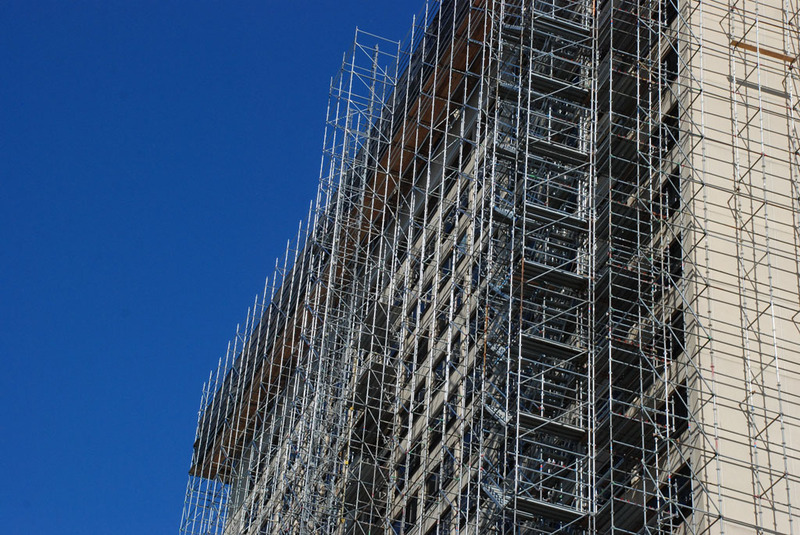 This scaffold will also help workers demolish the exterior and it will be dismantled level-by-level as the building comes down. 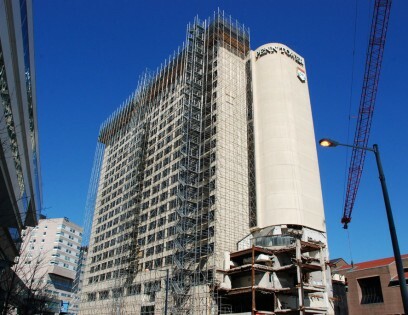 We provided 3 decked levels at the top of the building for access. 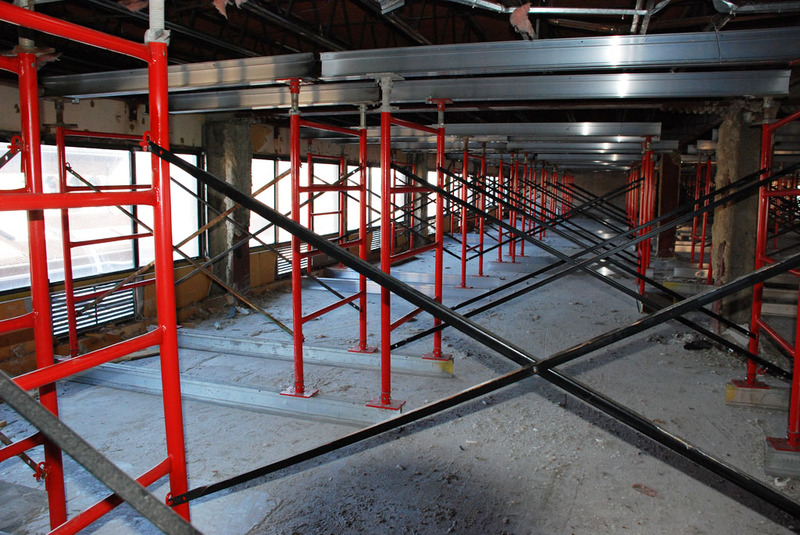 We used 2 Beta Max Material Hoists with baskets to feed the scaffold up to the crews erecting it. Two hoists were required for productivity. They are estimating getting the building down to 5 floors and then they will bring in a high-reach excavator with hydraulic jaws that will chew up the remaining structure. This is all being done to be as minimally invasive to the other businesses in the area. And then Superior came in and added shoring to 16 floors at the same time! Yes, at the same time. 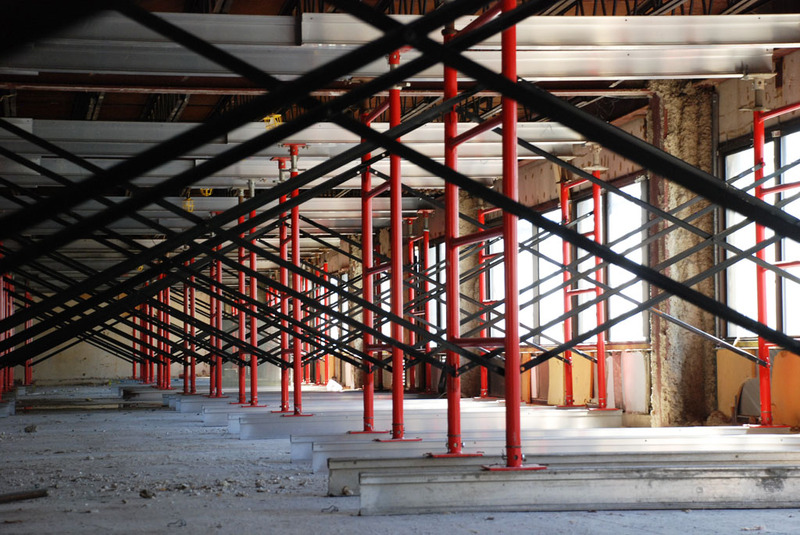 Each floor’s shoring will come down and out as the work gets closer to the ground. 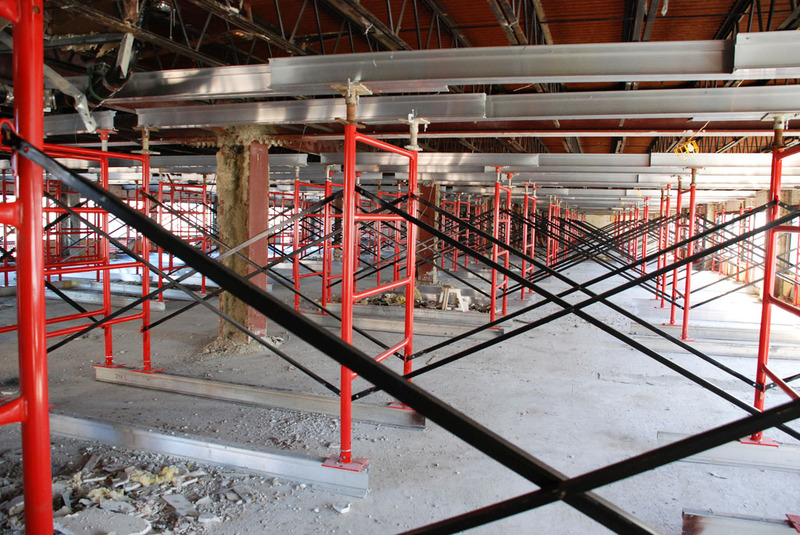 We used a combination of high load frames, post shores, 1200 lineal feet of aluminum beams per floor, 6′ trees, 200 trusses per floor, system scaffold and much more to make this happen. Demo teams started at the roof to dismantle the structural pieces. Using Bobcats and jackhammers most of it will be cut into manageable sizes and put into large bins and then moved to the ground via a crane and mast climbers. Smaller pieces will be sent down the elevator shaft. We are very proud to be a part of this prestigious and unique project. 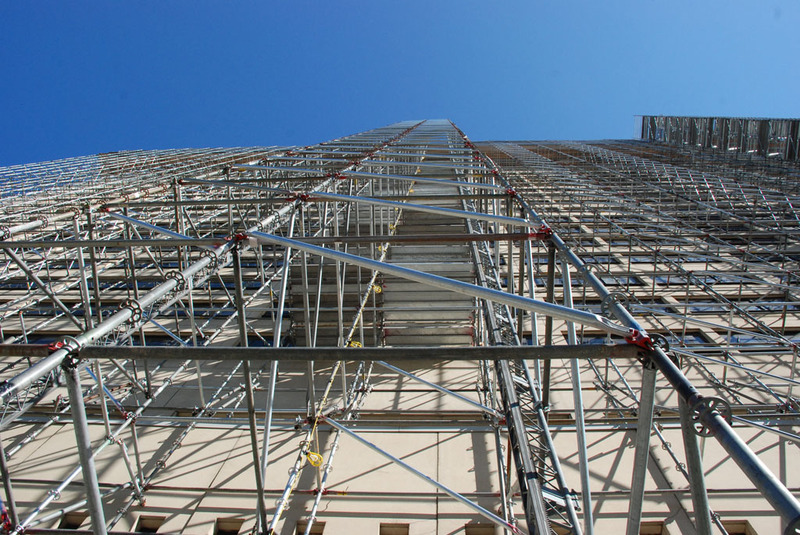 If you need scaffolding, shoring, mast climbers or any access equipment call Superior today at (215) 743-000 or visit www.superiorscaffold.com. To keep up with our company and current jobs read our blog.